Residents of Leeds, Alabama will have an opportunity to vote yes or no on a tax referendum in a special election on Tuesday, January 22, 2019 that would fund some much needed projects. 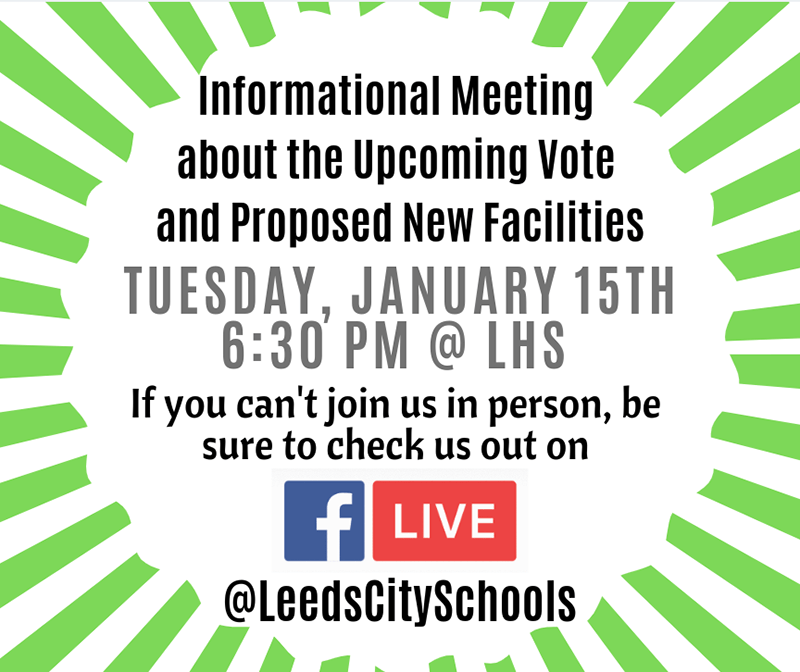 A Leeds Town Hall meeting is scheduled for 6:30 p.m. on Tuesday, Jan. 15 in the Leeds High School auditorium to discuss the details and plans provided the citizens vote yes on this referendum. The proposed tax increase of 9 mills would equate to $90 per $100k home per year and money would be split between Leeds City Schools and the City of Leeds with 70% going to schools and 30% going to the city. This money would fund much needed projects that include a new football stadium and other athletic facilities at the high school and a new city complex to include library, civic center and other city departments. Everyone is encouraged to attend this town hall meeting to see the plans and get answers to questions that anyone may have. For those who cannot attend, Leeds High School will provide Facebook Live. The City of Leeds would like for each resident to have information needed to cast an informed vote. This special election is for all residents of the City of Leeds and voting will be held at Leeds Civic Center.